Hinckley is set to commemorate 100 years since the end of World War One on Sunday 11 November by organising a number of events throughout the day. This is in line with a programme of events taking place in the United Kingdom, Channel Islands, the Isle of Man, and at scores of locations overseas, including New Zealand, Ireland, Australia, Bermuda, France, Belgium, Canada, the United States and Germany, to name but a few. Events in Hinckley will start with the annual Remembrance Sunday service and parade, which will take place at 11am at the war memorial. The service will start just before 11am and all are welcome to attend. Anyone planning to come along is respectfully asked to ensure they arrive at the memorial gardens by 10:45am. There will be a parade from the hospital car park on Mount Road to the war memorial before the service. Following the service, there will be a parade down Castle Street, through the Market Place - where a salute will be taken - and into Station Road where the parade will disperse. The evening events will start at 6:30pm at the ‘Lest we Forget’ illuminated sign located on the corner of Station Road (opposite HSBC Bank). The lights have been continuously lit for the last four years to symbolise the duration of World War One and will now be turned off to mark the guns falling silent at the end of the war. People will then be asked to make their way to Argents Mead where the rest of the evening’s events will take place. This will include the playing of the last post at 6:55pm, followed by the lighting of a beacon at 7pm signifying the light of peace that emerged from the darkness of four years of war. St Mary’s Church bells will then ring out at 7:05pm and the evening's events will come to a conclusion at 7:10pm when Joe David, Hinckley’s Town Crier, will deliver a specially written piece entitled ‘Cry for peace around the world’, a nation’s tribute. Each year we remember all those who have fought and currently serve for our country, but this year we take the opportunity to remember and highlight the bravery of those who fought, lived and died in the First World War. On the centenary of the Armistice we give thanks for peace and for those that returned, and remember the sacrifice of those who died. Barwell - Armistice Day Memorial, Barwell War Memorial, 10am to 12pm. Botcheston - Following the service at the war memorial in Desford, there will be a service at Botcheston War Memorial at 12:30pm. Burbage - Parade from Grove Road to Church Street War Memorial at 10am. Unveiling of names of First World War servicemen recently added to the war memorial followed by service at the war memorial at 10:20am and two minute silence at 11am. Quarter peal of bells begins at St Catherine’s Church from 11:05am.There will be an exhibition entitled ‘Burbage Fallen’ at Millennium Hall from 1:30pm to 4:30pm. At 2pm and 3:10pm there will be a Concert for Remembrance by Harmonic Voices at Millennium Hall. At 7pm, the lighting of commemorative beacon on Sketchley Hill Farm recreation ground (Tilton Road). Desford - Service at the war memorial on Main Street from around 10:30am to 11:30am. Earl Shilton - Remembrance Day, Earl Shilton Town Centre War Memorial. Remembrance parade starts at 11am and the lighting of the beacon events take place at Queen Elizabeth II Hallfields Park from 6:30pm. Market Bosworth - Remembrance Service at war memorial, 11am. At Market Bosworth Memorial Gardens there will be a short ceremony to bless the newly restored gardens as part of Market Bosworth's commemoration of the centenary of the end of the First World War. Stoke Golding - The remembrance service at St Margaret's Church will be followed by the annual laying of wreaths at Hinckley Road Cemetery. Church bells at St Margaret's Church will ring half-muffled from 9am to 9:45am prior to the morning service in St Margaret's Church. Then a Quarter peal of continuous ringing without muffles from 12:30pm to 1:15pm in harmony with bells worldwide. The 1st Stoke Golding Scout Group will be hosting a Peace Tea at Stoke Golding Village Hall from 11:30am following the Remembrance Day service at Hinckley Road Cemetery. 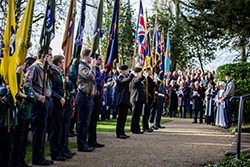 Stanton under Bardon - Remembrance service will take place at the war memorial. Witherley - Witherley Parish Council will be lighting a beacon. Photo credited to Alex Benyon.